SIMETRI, a leading Orlando technology firm, announced today that it has been awarded a subcontract, to provide the Virtual Patient System (VPS) Trauma Moulage Kits to the U.S. Army. The contract, through a partnership with Moulage Sciences and Training (MST), supports the U.S. Army PEO STRI (Program Executive Office for Simulation, Training and Instrumentation), and will provide important simulated injuries products for military medical training. Each Trauma Moulage Kit and its associated equipment and accessories will accurately represent common traumatic injuries for blast, burn, laceration, avulsion and penetrating injuries. 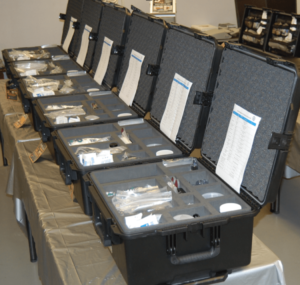 The moulage (simulated wound) kits are used to enhance the medical training capability that currently exists at the military’s Medical Simulation Training Centers (MSTCs), which are standardized Army training assets located at various military installations worldwide. These centers deliver effective medical training with a standardized training platform to better prepare Soldiers to apply medical interventions under combat conditions. “Training the warfighter to recognize and respond with correct medical treatment is critical to our Soldiers on the battlefield. SIMETRI is honored to be a part of the MST team to provide this state of the art injury simulation technology to ensure the readiness of our Army medical personnel,” said Angela Salva, president and CEO of SIMETRI. Each Trauma Moulage Kit provides both partial surface injury replication, for example a facial burn mask, as well as common attachment links to selected mannequins or task trainers for multiple partial and complete amputation extremity variants. It will also include realistic blood and other body fluid visual effects and be capable of attaching to training mannequins and partial task trainer fluid receptacles.